The century-long epidemic of cigarette smoking has caused an enormous, avoidable public health catastrophe in the United States. Since the first Surgeon General’s report on smoking and health was published 50 years ago, more than 20 million Americans have died because of smoking. If current rates continue, 5.6 million Americans younger than 18 years of age who are alive today are projected to die prematurely from smoking-related disease. Most of the 20 million smoking-related deaths since 1964 have been adults with a history of smoking; however, 2.5 million of those deaths have been among nonsmokers who died from diseases caused by exposure to secondhand smoke. More than 100,000 babies have died in the last 50 years from Sudden Infant Death Syndrome, complications from prematurity, complications from low birth weight, and other pregnancy problems resulting from parental smoking. The tobacco epidemic was initiated and has been sustained by the tobacco industry, which deliberately misled the public about the risks of smoking cigarettes. Despite significant progress since the first Surgeon General’s report, issued 50 years ago, smoking remains the single largest cause of preventable disease and death in the United States. Smoking rates among adults and teens are less than half what they were in 1964; however, 42 million American adults and about 3 million middle and high school students continue to smoke. Nearly half a million Americans die prematurely from smoking each year. More than 16 million Americans suffer from a disease caused by smoking. On average, compared to people who have never smoked, smokers suffer more health problems and disability due to their smoking and ultimately lose more than a decade of life. The estimated economic costs attributable to smok­ing and exposure to tobacco smoke continue to increase and now approach $300 billion annually, with direct medical costs of at least $130 billion and productivity losses of more than $150 billion a year. The scientific evidence is incontrovertible: inhaling tobacco smoke, particularly from cigarettes, is deadly. Since the first Surgeon General’s Report in 1964, evidence has linked smoking to diseases of nearly all organs of the body. In the United States, smoking causes 87 percent of lung cancer deaths, 32 percent of coronary heart disease deaths, and 79 percent of all cases of chronic obstructive pulmonary disease (COPD). One out of three cancer deaths is caused by smoking. This report concludes that smoking causes colorectal and liver cancer and increases the failure rate of treatment for all cancers. 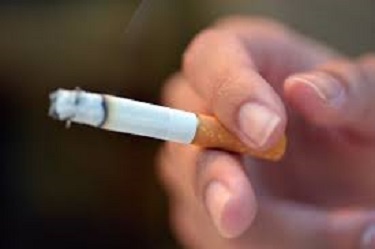 The report also concludes that smoking causes diabetes mellitus, rheumatoid arthritis and immune system weakness, increased risk for tuberculosis disease and death, ectopic (tubal) pregnancy and impaired fertility, cleft lip and cleft palates in babies of women who smoke during early pregnancy, erectile dysfunction, and age-related macular degeneration. Secondhand smoke exposure is now known to cause strokes in nonsmokers. This report finds that in addition to causing multiple serious diseases, cigarette smoking diminishes overall health status, impairs immune function, and reduces quality of life. Smokers today have a greater risk of developing lung cancer than did smokers in 1964. Even though today’s smokers smoke fewer cigarettes than those 50 years ago, they are at higher risk of developing lung cancer. Changes in the design and composition of cigarettes since the 1950s have increased the risk of adenocarcinoma of the lung, the most common type of lung cancer. Evidence suggests that ventilated filters may have contributed to higher risks of lung cancer by enabling smokers to inhale more vigorously, thereby drawing carcinogens contained in cigarette smoke more deeply into lung tissue. At least 70 of the chemicals in cigarette smoke are known carcinogens. Levels of some of these chemicals have increased as manufacturing processes have changed. For the first time, women are as likely to die as men from many diseases caused by smoking. Women’s disease risks from smoking have risen sharply over the last 50 years and are now equal to men’s for lung cancer, COPD, and cardiovascular diseases. The number of women dying from COPD now exceeds the number of men. Evidence also suggests that women are more susceptible to develop severe COPD at younger ages. Between 1959 and 2010, lung cancer risks for smokers rose dramatically. Among female smokers, risk increased 10-fold. Among male smokers, risk doubled. Proven tobacco control strategies and programs, in combination with enhanced strategies to rapidly eliminate the use of cigarettes and other combustible, or burned, tobacco products, will help us achieve a society free of tobacco-related death and disease. The goal of ending tobacco-related death and disease requires additional action. Evidence-based tobacco control interventions that are effective continue to be underused. What we know works to prevent smoking initiation and promote quitting includes hard-hitting media campaigns, tobacco excise taxes at sufficiently high rates to deter youth smoking and promote quitting, easy-to-access cessation treatment and promotion of cessation treatment in clinical settings, smoke-free policies, and comprehensive statewide tobacco control programs funded at CDC-recommended levels. Death and disease from tobacco use in the United States is overwhelmingly caused by cigarettes and other burned tobacco products. Rapid elimination of their use will dramatically reduce this public health burden. New “end-game” strategies have been proposed with the goal of eliminating tobacco smoking. Some of these strategies may prove useful for the United States, particularly reduction of the nicotine yield of tobacco products to non-addictive levels.